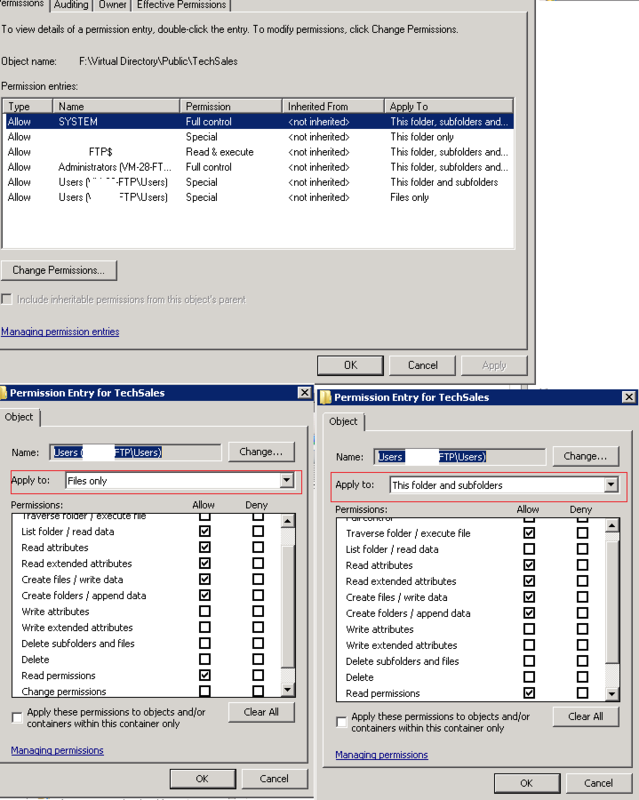 Create a folder that you want the FTP service to point to. Right-click the folder, click Properties, and then click the Security tab. Grant Full Control permissions to only the Administrators group.NOTE: Remove the Everyone group if it is present. Click Advanced, and then click Add to add a new rule. In the account selection list, double-click the Anonymous User account or the group that is used for FTP access. In the Apply Onto drop-down list, select Files Only. Click Add to add another rule. Select the account that you selected in step 4. In the Apply Onto list, click to select This Folder only. Click OK until you have closed all of the property windows. It doesn't seem to be working...? Virtual directories that i want displayed are no longer available? The use of place holders will help. Virtual directories have higher priority over physcial paths, as we have told iis not to display VD's a place holder will assist you with redirecting the user neatly. This piece of writing will assist the internet viewers for setting up new website or even a weblog from start to end. Look at this website: How To Password Protect Folder In Less Than Four Minutes Using These Amazing Tools.